Years ago, a friend of mine said, "Are you one of those Asians that buy Sony everything?" I laughed mainly because I didn't even realise how many Sony products I had at the time--camera, TV, laptop, etc. Fast forward a few years and I never thought I'd end up getting so many Revlon products, especially the Colorstay eyeliners. It was unintentional, and I picked all of these up before I had even started blogging. But that's not the point! 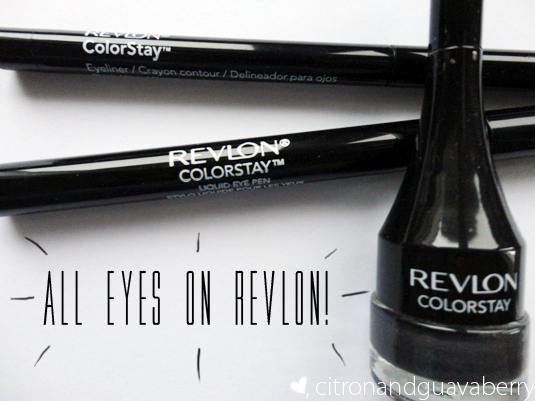 Revlon seems to produce the best drugstore quality products, and today I'll be reviewing their automatic liner (Colorstay Eyeliner) (which I also talked about here), their liquid eyeliner (Liquid Eye Pen), and their gel liner (Creme Gel Eyeliner). The automatic liner and the cream/gel liner isn't the blackest of the black with one swipe, but I personally have no issue with that. Smooth and does it's job. The liquid liner comes in a stiff felt tip pen, which makes it easy to control the thickness of the line. Very black ink leaves a crisp finish that doesn't bleed. The cream/gel liner is a very creamy grey-black, comes with a brush and is easy to apply. There is a very subtle amount of sparkle in this product, which I had never noticed in my 3 years of owning this product until I did a hand swatch ._. You poor, poor liquid liner. Can't say too much about the gel/cream liner, it did hold up pretty well considering it's creamy consistency. And again, the automatic liner clings like iron. "BABY WON'T YOU TELL ME WHY, THERE IS SADNESS IN YOUR EYES" Sorry, been serenading my dog with that song all day--but you get the drift--it's a tear/water test. Eyeliner gods HAVE MERCY ON THIS LIQUID LINER WHY??! Ink literally ran off into the sink in a heartbeat. The other two liners still held up pretty well with a small amount of water applied with rubbing/smudging motions though. There still is some additional smudging, but nothing significant and extremely noticeable. EDIT: THIS IS WHY I'M NOT A SCIENTIST, I make conclusions without finishing/trying all possibilities, damnit Vanessa. 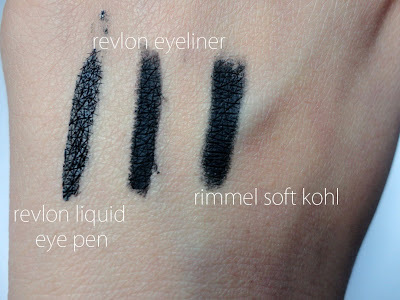 The automatic eyeliner can actually be built up pretty dark, and I've compared it to my other black eyeliner, the Rimmel Soft Kohl liner, as well as the super dark liquid eye pen. - The gel/cream liner is fabulous, and I personally like the brush + glass packaging, but if you're after the blackest of the black gel liner, skip this one. 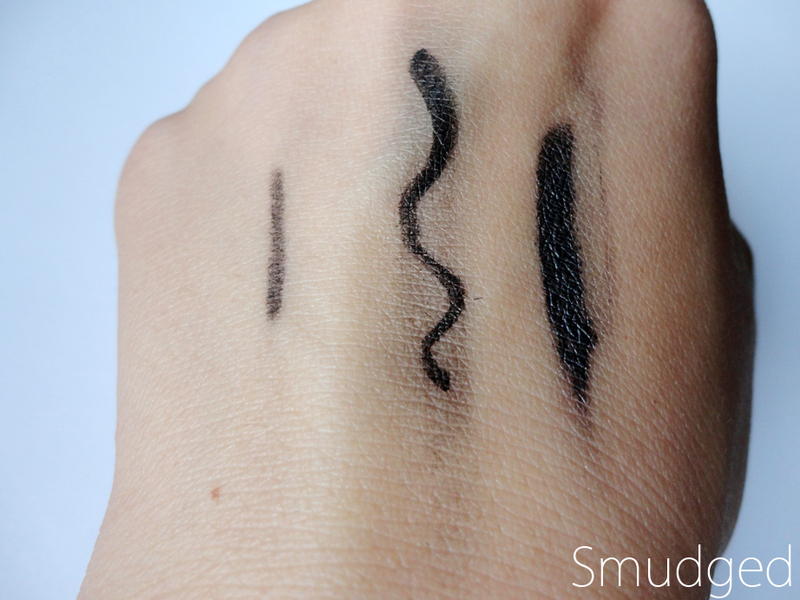 - Today I found out if you do two layers of the automatic liner, you can get a pretty decent black instead of just a grey-black achieved with one swipe as seen in the photos above. EDIT: Actually goes pretty dark! Anyways, I hope you found this post interesting? Insightful?....lousy? Either way, suckers, you got to the end of this post HAHAHAHAHA. 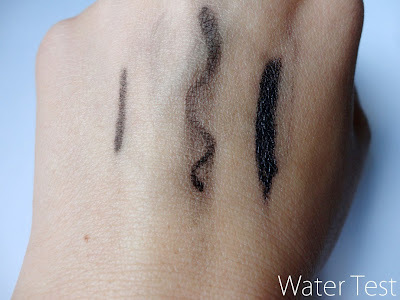 Its a shame the liquid liner didn't survive the tests very well, it looked so black! Yeah, it's a shame because the ink really really black, and it's so easy to use! But I've heard plenty of good things about the Kat Von D one, except it is a bit pricey for me. haha most of the ones i tried are bad too. except for kpalette but its around PHP900.00 and i was hoping to find something lower than that. ill check out kat von d :) thanks vanessa! It's a shame, because I loved it at first until I found out it smudged! I tried it on my inner rim and lower lids/lash line today [heh, just for you ;)], and it's not very pigmented and long lasting on the lower rims, and it does smudge a bit on the lower lash line, but it is minimal, unnoticeable smudging. But then again my eyes do get pretty watery with all eyeliners (darn sensitive eyes), so this might last longer on your eyes if you don't have sensitive eyes! To add on. I recently found out that this fat cat that is on tumblr and fb is called the Pusheen cat. Hehe. Are you a cat lover? YEAH! I SEE THIS FAT CAT ON TUMBLR ALL THE TIME AND SKMsakmdsFKLD so cute! I like cats, but I have a dog who dislikes/is scared of cats so no cat for me anytime soon, haha. They're so fluffy and adorable though! ahh i'd be tempted to get the automatic one but i'm a sucker for super black eyeliners. And omg yess the pusheen on facebook, I literally never use the standard emoticons anymore, I think my friends are getting pretty annoyed with me sending them after every message though! Gah, I had to retest the automatic liner to see how dark it would go, and I'm embarrassed that I didn't post this sooner, but I've posted a picture above to show how dark it goes, and it goes pretty dark! OOO, awesome post! Such a shame about the liquid liner, though. What's your favourite liquid eye liner? I went through a stage of using just gel eye liner, but man - they dry so fast. I feel like I can use them really well for a week or tow, as they go on very smoothly, but once the airs gets in they're a nightmare! Not the greatest value for money, are they? Thanks! And haha, I don't have a favourite liquid liner...yet! Oh that's a shame--I've had my Revlon gel liner for about 3 years now! I always make sure to seal it real tight, but I know packaging and texture of the liner can either prolong or shorten the life of a gel liner! I've heard great things about the Rimmel Exaggerate liner too! Everyone keeps recommending me that liner, so maybe I'll pick that up next! Wow the watertest was amazing this is a really good gel eyeliner. Now I want purchase this product. Your review is very detailed many thanks for that. I find primers also really help liners stay on longer! Your blog photo's are taken in such a fab way! Such a shame that the products aren't the greatest! Guess when I'm running out of my liquid liner, this one I will steer clear from! Thanks for the review dear! Yeah, Revlon did terrible with this one. I actually think Revlon's automatic liner does the job! It's pigmented and it only goes south after 7+ hours of wear. 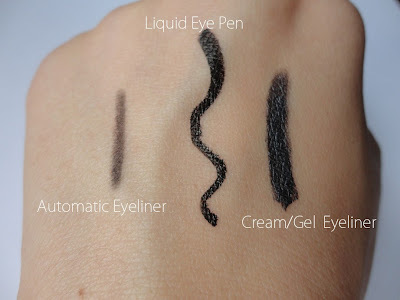 Another option I like are the NYX Slide on Liners, and I've also heard good things about the Milani's Liquif'eye pencils! What a great insightful post! I loved the detail review. 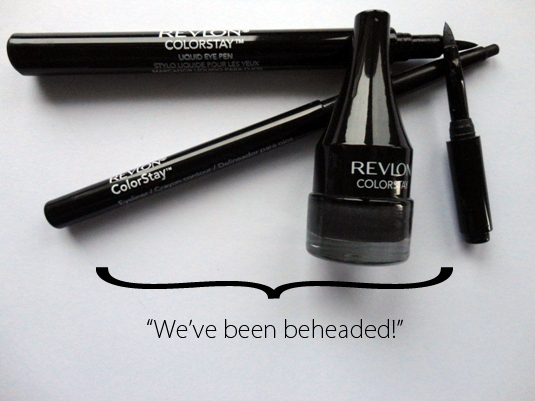 Darn, you would expect Revlon to product better things than this, eh? My first pencil liner turned out to be one I also hate with a burning passion, haha!